The provision of a quality Montessori education – Montessori International College is committed to ensuring the provision of quality Montessori programs with highly qualified Montessori educators in each class and classrooms that are adequately resourced with a full suite of Montessori materials. All-inclusive investment – Unlike most other independent schools, MIC includes all resources, primary camps, some excursions and events within our tuition fees. We also do not require a school uniform which can be a costly expense at other independent schools. (The senior primary Canberra trip, adolescent camps, national testing and a contribution towards ongoing Montessori staff development are funded on a user pays system). Affordability – It is important to us that a Montessori education is available to a broad cross-section of the community so a key objective it to keep fees as low as possible, while ensuring we continue to meet the college’s financial obligations. 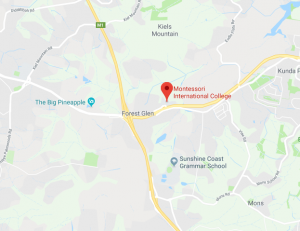 While MIC fees are lower or comparable to other private schools on the Sunshine Coast, our fees are considerably lower than other Montessori schools in Australia and overseas. We have been able to achieve this through careful fiscal management and sustainable growth planning. Enrolment levels – Montessori International College is small by design which allows us to have a collaborative and inclusive social environment where students enjoy close-knit relationships and highly personalised learning programs. Our enrolment levels are set so that we can continue to provide a quality Montessori education in a ‘small school’ environment, with the benefits of economies of scale as we sustainably grow our school. The financial needs of the college – Montessori International College operates within a 10 year financial plan which not only provides for the provision of quality learning spaces and ongoing staff professional development, but further capital improvements are also considered to ensure the college continues to grow and improve going forward. Compliance with government funding and other regulatory requirements – As an independent school in Australia, MIC is required to meet a number of requirements with regards to government funding and other regulatory obligations. MIC’s status as a non-profit organisation – As a non-profit organisation, Montessori International College’s financial plan ensures the college remains financially prudent and provides for the financial viability of the college long term. Discounts are offered for prepayment and payment plans; bursaries are scholarships are also available. Contact the college for more information. As our Early Years Program is an Approved Child Care Service, some families may also be eligible for government subsidies through Centrelink. Contact Centrelink for more information.